Home » Education » Why Celebrate Global School Play Day? For the past two years, we’ve celebrated Global School Play Day in our elementary school. But this year, after watching Peter Gray’s Ted Talk: The Decline of Play and Rise of Mental Disorders, we decided it was important to include our secondary students as well. We wanted our adolescents to have the opportunity to get to know and play with our elementary students, and we wanted to give them time to experience unstructured play without electronic devices. Boosts Creativity — When children create make-believe games, they use their imaginations and develop abstract thinking. Teaches Social Skills — Playing together, children learn how to get along with others. They develop empathy while learning to negotiate and compromise. Develops Critical Thinking Skills — During unstructured play, children take risks, make mistakes, and learn important problem-solving skills. Promotes Emotional Health — Free play reduces anxiety and stress in children, allows them to sleep better, and improves overall emotional health. Fosters Independence — Children learn to make decisions, follow their own interests, and gain self-confidence. Improves Physical Fitness — Playing actively helps children improve gross motor skills and build healthy bodies. Would our secondary students show up to school if they knew they were going to play all day? To avoid having students stay home, we decided to surprise them with Play Day. We let them know they would have some time to play, but didn’t tell them it would be the entire day. Was a full day too long? Would students get bored? As it turns out, boredom was actually the goal. Children use their imaginations when they get bored. We told teachers that if students said, “I’m bored,” they were not to solve the problem — rather, they should tell student to use their imaginations and find something to do. Would kids of different ages mingle and play together? 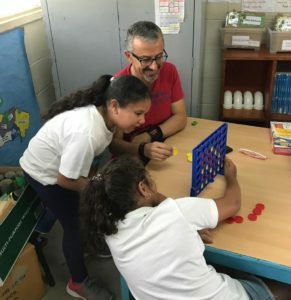 We wanted students of all ages to mingle, but in a school setting where students are constantly separated by age, how would we make this happen? To encourage student interaction, we decided to set up “stations” around the school. 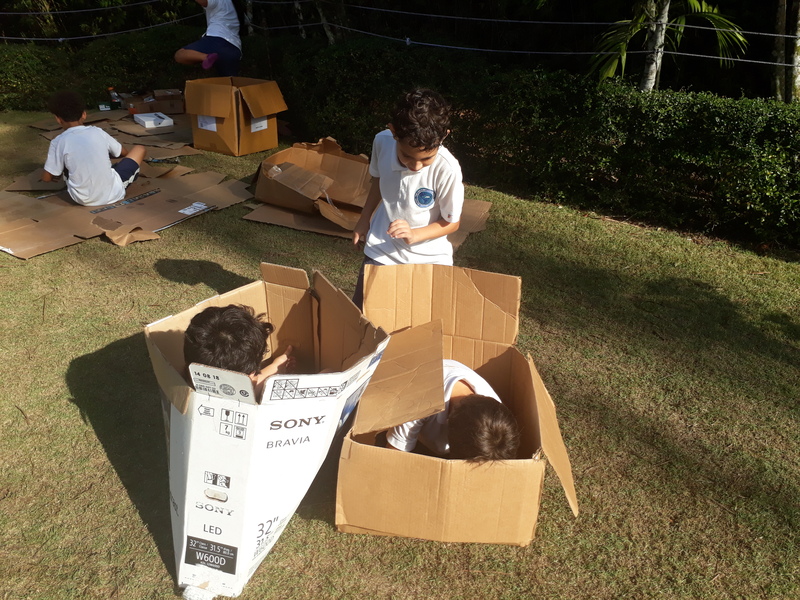 One outdoor area had boxes and pieces of cardboard for inventing games, another became an area for makerspace, one classroom had theater materials, several classrooms were set up with board games, there was a grassy area with balls and skipping ropes, and there was an area filled with puzzles. Students of all grades were free to wander around, decide where they wanted to play, and move on whenever they wanted to. As it turned out, our concerns about high school student buy-in were warranted. Although many of them liked the idea, not all of them were enthusiastic. When the day started, a group of high school students came up to me and begged me to let them go do their homework instead of playing: “Carla, please, this is such a waste of time and we really have a lot to do.” I let them know that this Play Day was non-negotiable and, with a resigned shrug, off they went. Despite some students’ reluctance and some of our initial concerns, the day was amazing. At first, some students wandered around looking a little lost, but they soon they found things to do. As the day progressed, the different age groups began to mingle. At times, small arguments broke out, but the kids were able to work out their differences quickly enough. Close to 400 students played together all day and the school was surprisingly quiet and peaceful throughout it all. Teachers were exhausted but happy. Everything went so much smoother than expected. The feeling was shared by students and teachers: once a year is not enough. Let’s do this again! 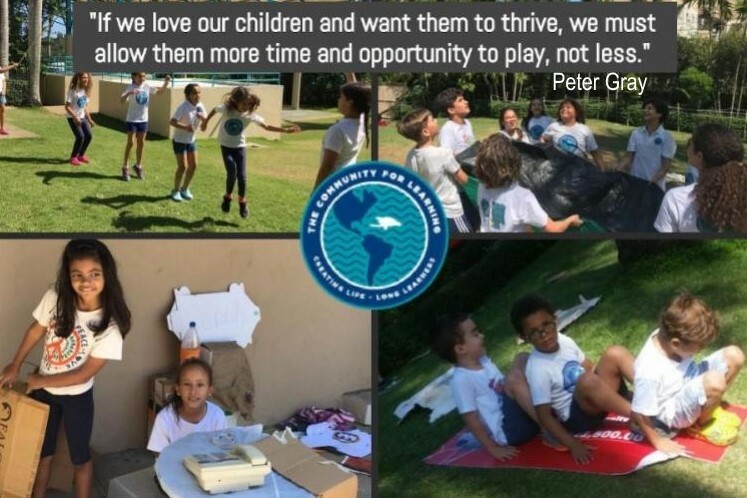 We also hope that celebrating Global Play Day will inspire parents to leave space for their children to play without electronics and without adult guidance. Our kids need it. 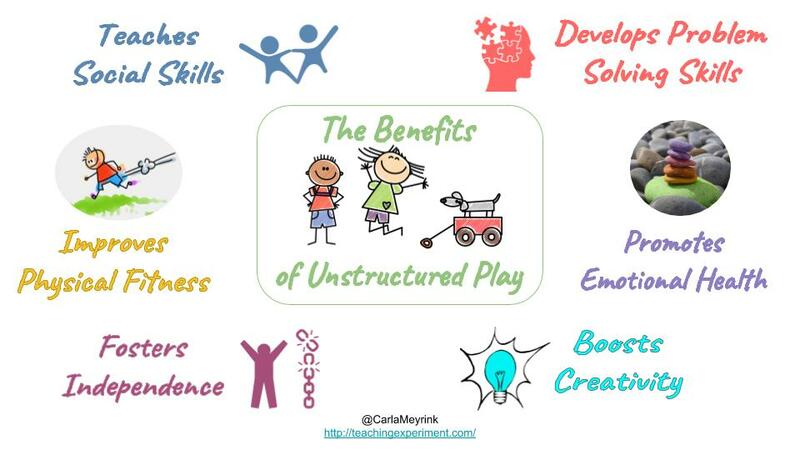 Setting up stations and allowing students free rein of the school helps create a true feeling of unstructured play and allows students space to mingle. Keep kids safe: have teachers monitoring the stations to watch for bullying or unsafe play. Definitely do this for a full day. There are huge benefits to students’ imagination and creativity when students go through moments of boredom.